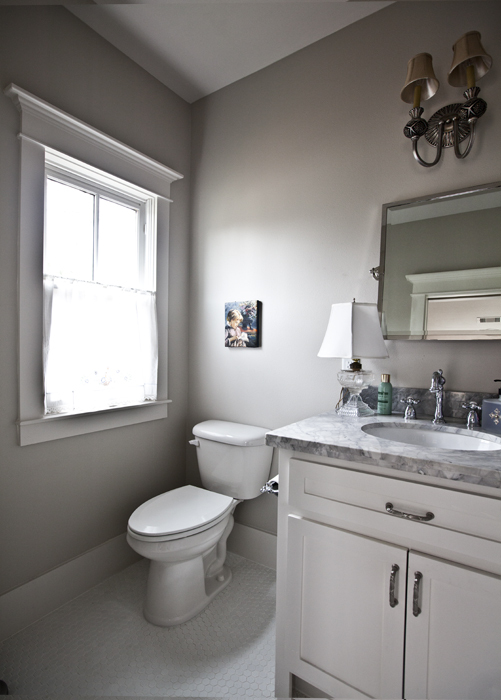 Come on into our little guest quarters bath. It’s tight in here, so we’ll have to squeeze in to see. It’s a small addition, but it’s the details that make a room, I think. Here’s the little shelf, that holds the towels and a sweet little oil paining. The space was unused, and in this small space, we need to make every inch count, without making the room feel crowded. 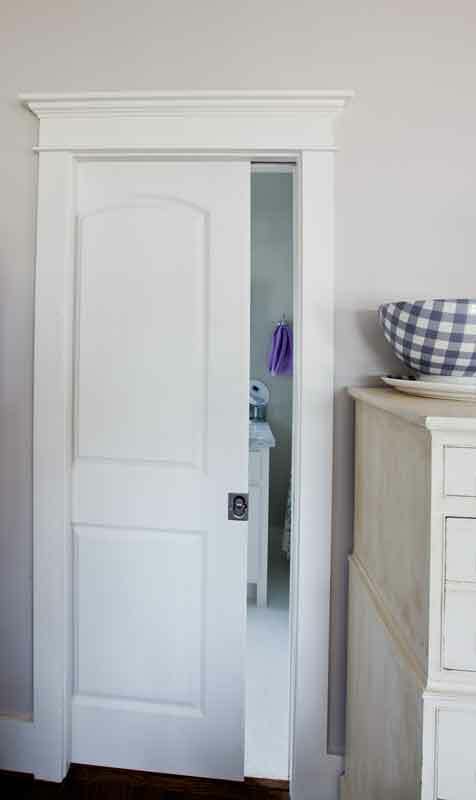 Adding the little shelf means guests can grab a towel, without crawling on their hands and knees to get in the vanity. I’m trying to add touches here and there to make a guest’s visit here more comfortable and pleasant. And I just love this towel rack. It reminds me of an old train luggage rack. What do you do to make your guests feel special? Oh, I love that rack, too and what a great addition. You make me laugh Anita! The bath is small, but it is functional and pretty. lOVE THE TOWEL RACK! and yes it does remind me of a train luggage rack as well! I have the same shelf also. I feel in love with it when I saw it. The bathroom is so sweet. I would love to know where you found your shower curtain please. 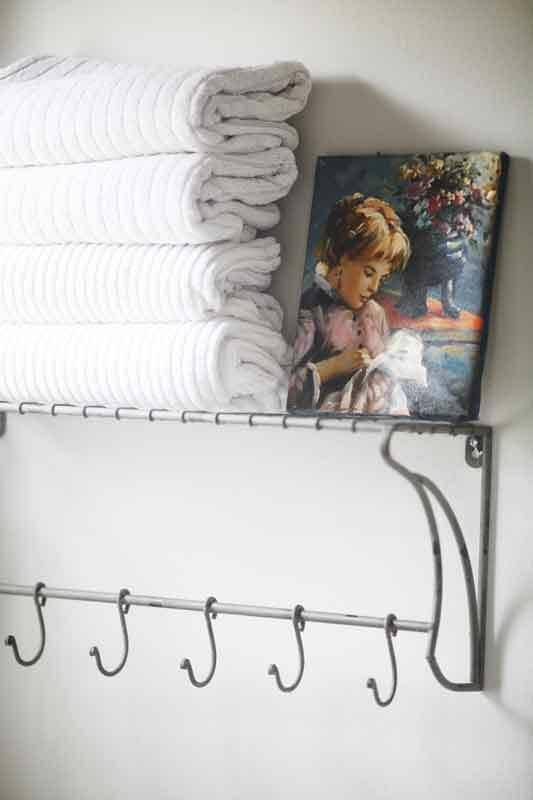 I have a similar style shelf in my bathroom… I find it tricky to fold bath towels to fit. Yours look like they fit really well…what’s your secret fold??? And I love the hooks on the bottom. I think I’ll add some s hooks to mine! That IS a cute shelf!!! Our guest bath is just as small. I have 2 towel racks in there and also an over the door towel rack on the back of the door to the guest room. I also have a basket filled with soap, toothbrushes, toothpaste, floss, etc. in case they forgot anythng. The shower has shampoo, conditioner, and body wash in it too. Hope you have a great holiday weekend, Anita. I have a blow dryer, curling iron and other appliances in the guest bath so when my daughters fly in they don’t need to pack heavy things. I keep fragrance free products for one who is allergic. Funny thing is I filled the bathroom with fancy towels and my son-in- law asked me for a towel the first day. I told him I just filled the rack with clean towels. He said, oh I didn’t think I should use those! My small guest bath is turned opposite yours and faces the tub/shower when you walk in. I hung two pictures in the space above the shower and you look up when walking in, made it look bigger. Your shelf does that too. It’s such a pretty bathroom. Love the grey touches. I question the usefulness of the hooks on the shelf. If the shelf was on a wall where a guest could hang their clothes or a robe would be more helpful, but I’m guessing there is no such wall. Perhaps dried flowers could be hung from the hooks, or soap on a rope, or a basket with miscellaneous bath supplies. 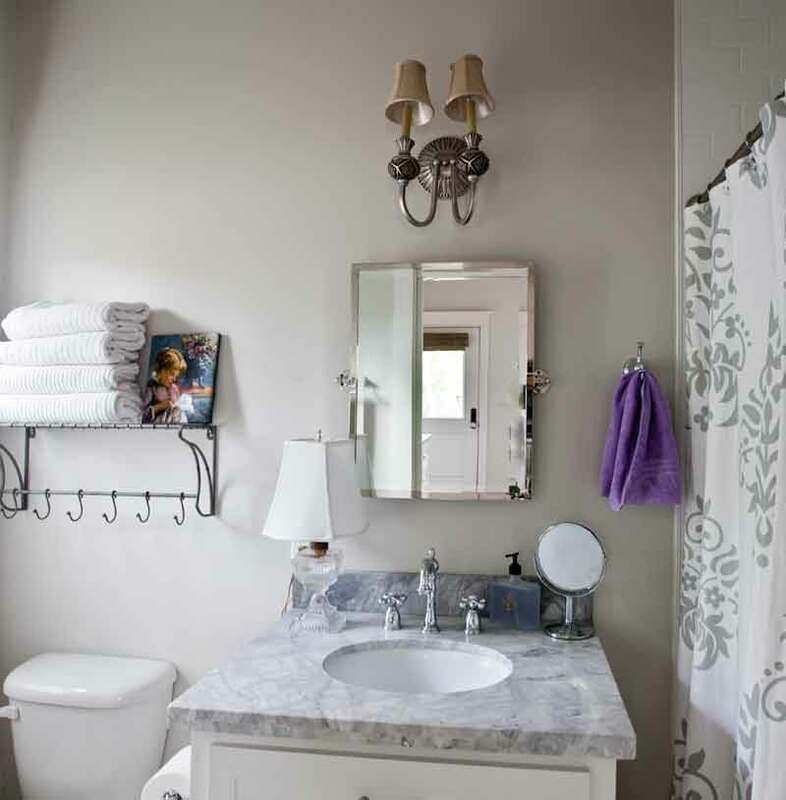 I so love this cute bathroom and I am sure your guests do too….love the towel rack…is it new or vintage? I have a bathroom addition downstairs about the same size. I do like that towel rack and one that I would purchase now for mine. Love both style of shower curtains. My bathtub is about the same size as yours , it looks to be. What are these smaller tubs called? Really to small for a bath but for grandkids it’s perfect size. I have the exact same bathroom. I put a plain shower curtain which I pull all the way back to give my room the feeling of another three feet. I keep all the shampoos etc. behind the curtain so you can’t see them. I also changed my mirror so it is horizontal and the light fixture has four lights that give you the horizontal feeling. The extra lights give you the feeling the room is bigger when it is all lit up. Everything in the room is white with pale gray walls. I then have a vase that I put silk flowers in each season to bring in the color with the same color towels. I don’t know if you like this but I love this small bath. The key is to make sure that the silk flowers are of good enough quality that they look real. Also, make the flowers in a vertical vase. What you think? I love everything that you did in the guest bathroom. If you don’t mind me asking, where did you buy the two shower curtains? They are beautiful! thank you! 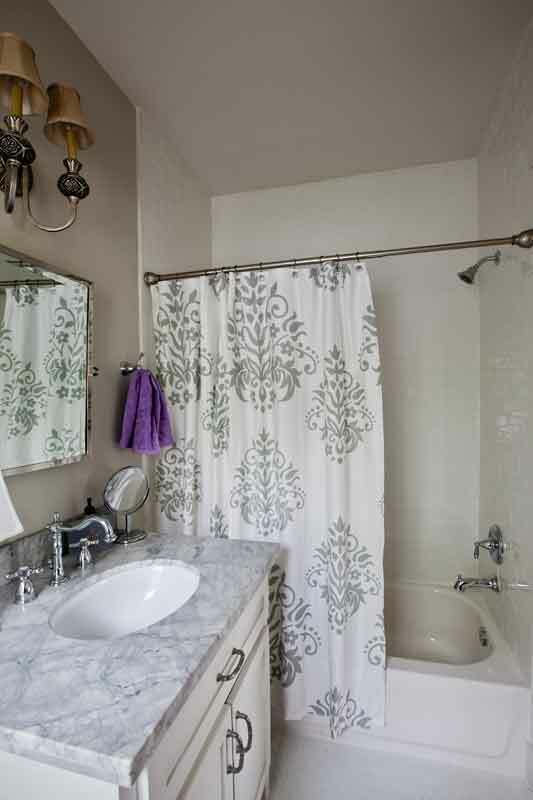 Did you keep the Layla Grace shower curtain in the Guest bathroom? I like this! Seems simple. Easily attainable look. I like the rack idea. cute cute! Can you share what the pain color was in here? 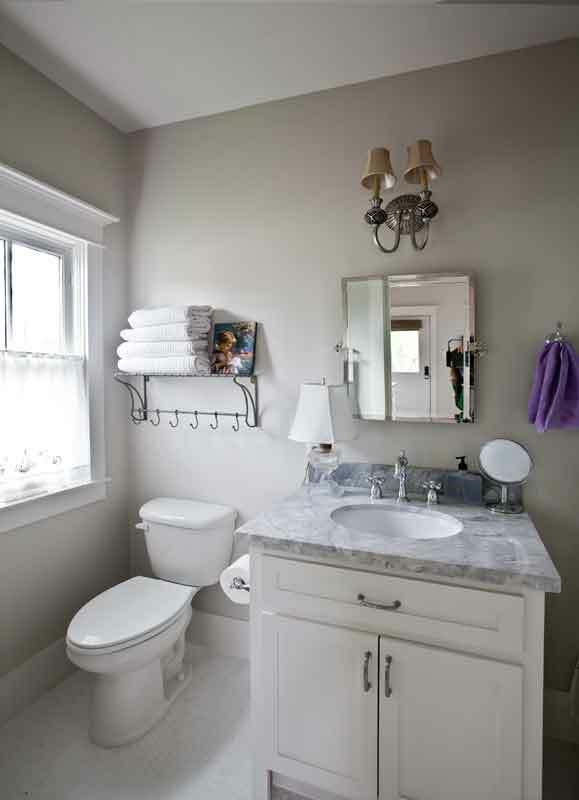 Love the addition of the towel rack. That wall above the commode was too bare. Also, a trick I use in my tiny bathroom is to pull the shower curtain left edge back to the middle, covering the shower head, faucets, etc, then swag it like a drapery off to the right side. That allows a visual to the back wall of the tub/shower making the little room seem at least a little less confining. That said, I prefer the gray if swagged but I prefer the white if covering the opening from side to side. I’m sure it’s beautiful regardless. The shelf rack really added to the good looks of the room…..